It's 09:46 in Preveza, Greece right now. 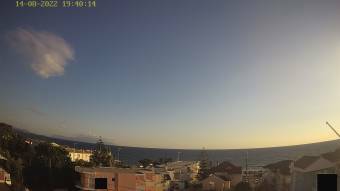 View towards Lefkada Webcam facing south towards Lefkada island and showing the current weather conditions in the Preveza area. Kompoti: City View, 20.5 miles away. Vasiliki (Lefkada): Vasiliki BayCam, 24 miles away. Parga: Beach, 29.6 miles away. Parga: Livestream Krioneri Beach, 29.6 miles away. Fiskardo: Port of Fiskardo - Kefalonia, 35.6 miles away. Lakka (Paxos): Port of Lakka, 38.2 miles away. Granitsa: Granitsa - Evrytania, 42 miles away. Kanoni (Corfu): Sea View, 62.9 miles away.